October is National Breast Cancer Awareness Month. In honor of the many women diagnosed with breast cancer, it is important to take the time to propagate breast cancer awareness. According to the American Cancer Society, the second most fatal cancer to women is breast cancer, with lung cancer causing the highest annual fatality rates in women. Aside from skin cancer, breast cancer is also the most common cancer affecting women. In women of all ages, ranging from less than 40 to over 65 years of age, there have been 64,640 cases of in situ cancer (also known as non-invasive cancers, meaning the cancerous cells do not spread to all parts, or outside of the breast), 232,340 cases of invasive cancer (cancerous cells that grow beyond the breast into healthy tissues), and 39,620 deaths (www.cancer.org). Early detection is vital for fighting and surviving breast cancer. It is vital that all women routinely conduct self breast exams and see your physician if you notice any changes or detect new lumps. Women who are over 40 years of age should have annual mammograms as well. Routine physical exams from your physician are also important in early detection of breast cancer. Although October has been designated as National Breast Cancer Awareness Month, individuals diagnosed with breast cancer suffer year-round. The purpose of this month is to increase awareness and donate to cancer research to help find better treatments and cures for breast cancer, but let’s not forget to donate and support Breast Cancer Awareness year-round. So this month, buy pink asics sneakers in honor of breast cancer survivors and those currently fighting the disease, donate as much as you can, and pin the pink ribbon to your shirts to support breast cancer awareness…but don’t forget you can donate next month as well! 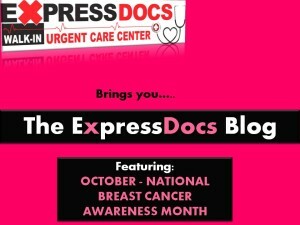 Take your first step in early detection and walk into ExpressDocs Urgent Care Center today to discuss with our physicians any breast cancer concerns you may have and to get your annual physical.